I have two switches by the front door. One controls the exterior door light. The other controls a light on a pole by the driveway. I want to replace the two switches with a single timer switch that turns both lights on at dusk and off at some later time. There is a GFCI outlet in the basement ceiling in the circuit for the driveway light. The poles on the switch for the driveway light are connected only to the hot and neutral wires from a single romex coming into the box. The switch for the door light does not have a GFCI in its circuit. The door light's neutral is pigtailed with other neutrals coming into the box (but not with anything wire from the romex for the driveway light). This switch requires a neutral, line, load, and ground. Clarification: 1. The two switches are on separate circuit breakers. 2. Both switches are in the same box. It is a 3-gang with one other switch in it as well. 3. The GFCI outlet cuts power to the driveway light when it triggers. Here is a picture and some explanation. It is crowded in there, but I have labeled the 5 romex cables that enter the box, and the switches. R1: goes to the driveway light. The driveway light, the GFCI in the basement, and another nearby indoor outlet are all controlled by said GFCI. The neutrals for R2, R3, R4, and R4 are all pigtailed together. R2, R3, R4, and R5 are all on the same breaker. R2 comes from the basement panel. Its black wire is capped, not connected to anything. R3 goes to the basement panel, it is on a separate breaker from R1. R4 goes to the outside door light. R5 goes to the indoor ceiling light. R5 is the only W/B/R romex, and the indoor light is wired here as if it is a three-way, but there is only a single switch that controls it. Perhaps this is vestigial. But this switch and light are not involved in my question. I understand now why I can't combine the two lights into one switch while they are on two different circuit breakers. That makes sense to me. It sounds like one option would be to move one of the lights onto the other's circuit, but I don't know if that would be possible. The driveway light switch with the GFCI circuit is only connected to the one romex, which I have to assume is the hot coming from the GFCI outlet, and the load going to the light. I don't even have access to the neutral for that at the box with the switch. I'd have to run another wire to this already crowded box. Is my reasoning correct? Each numbered square is a cable going into the GFCI box. 2 and 3: One of these goes to the indoor outlet. I have no idea where the other one goes. 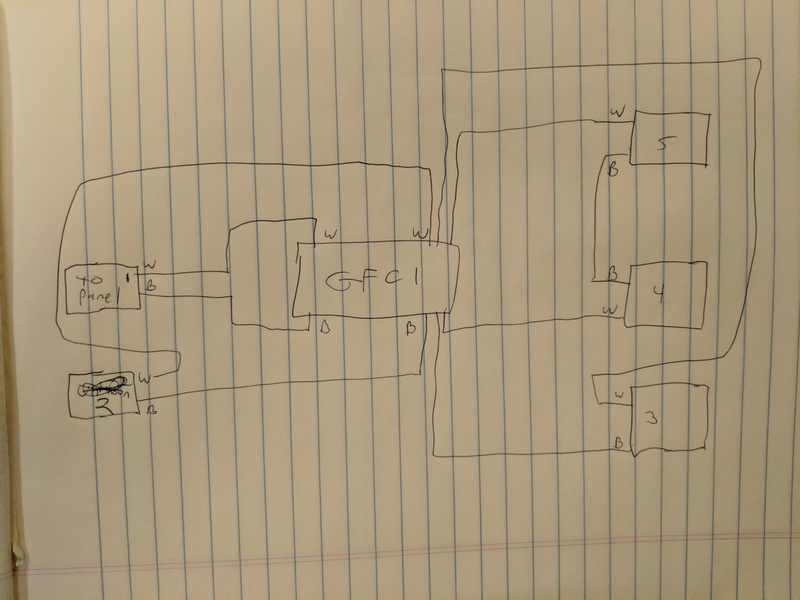 I mapped out what all the circuit breakers control a few years ago, but I must have missed one thing. 4 and 5: since these are in series, they must be the driveway light and switch for the light. 4 should be the switch, and 5 the light. Maybe this isn't good to run two loads in series? Parallel would be better, but I think the running the wiring for that would be much more difficult. But if doing it in series is dangerous, I don't want to do that. Connect cable 4 to 5 in the basement to make a passthrough, so that R1 at the switch box goes directly to the driveway light. Now the switch box only has one breaker circuit coming in. The basement GFCI does go there anymore. 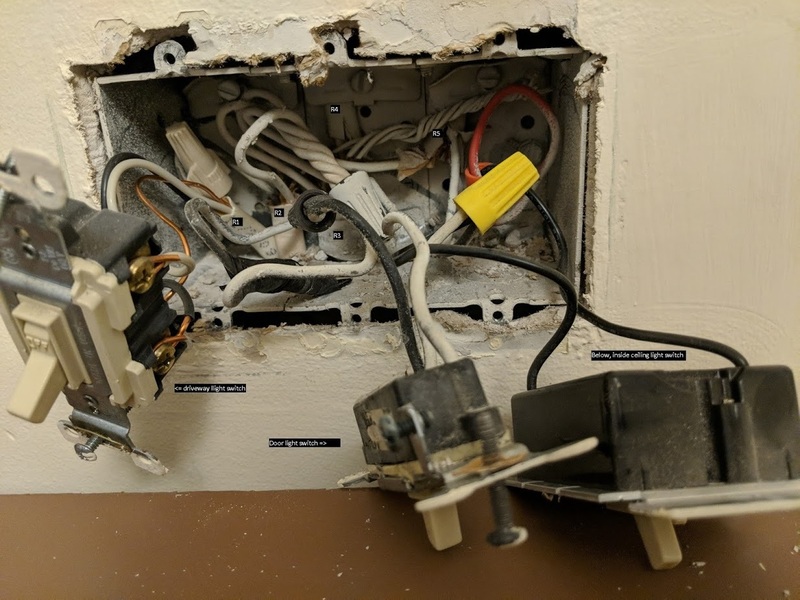 Take the hot and neutral feeding the box and split it so it feeds both the switch going to the inside light (R5) and the input of a new deadfront GFCI in the box. Output of the deadfront GFCI goes to R1 (driveway light) and R4 (outside door light). 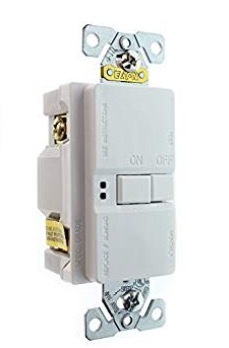 Using a GFCI breaker in the circuit panel would mean a solution similar to the above, except the switch box would be less crowded and everything on that circuit would be on GFCI - this includes 5 lights, 3 outlets and 2 garage door opener motors. 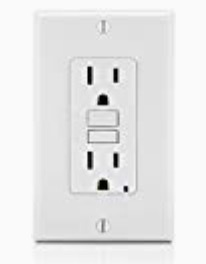 Alternately, if I can find the cable in the basement drop ceiling that goes to the switch box, I can stick a second GFCI outlet there instead of in the switch box or breaker. What I see coming into this box makes sense. R1 is an old style switch loop. It is not connected in any way to the rest of the cables in the box, and as such, this installation complies with Code as-is. Now, we really need to know what is going on in the box at the other end of R1. It may be possible to "flip" the switch loop so its power actually comes from here, and it does not use the other circuit breaker at all. That would provide the wires you need. Your edit shows that is very possible. Simply join those two whites that now go onto the GFCI LOAD, and the circuit bypasses that box entirely. Effectively, the line R1 goes straight to the lamp, which makes it easy to do what you want. Then you join R1's white to the bundle of whites, and R1's hot to the output of R4‘s switch. First, you may not need it. If the line to the pole is old enough, it predates the GFCI requirement, it is grandfathered. In any case what requires GFCI is not an outdoor lamp, but a branch wire buried to insufficient depth. Conduit at 18” depth does not need GFCI and nor does direct burial at 24". Nor does rigid or intermediate metal conduit at 6". Regardless, I can think of five ways to add GFCI. a GFCI+receptacle combo device in the now-spare site ...the usual way you'd think of doing it. a GFCI deadfront in the spare site. a GFCI+switch+single receptacle combo device to replace the switch. a GFCI that is a switch to replace the switch. This effectively uses the "Test" and "Reset" buttons to switch. You're never allowed to mix two different circuits' neutrals. Ever. That creates a serious safety hazard. Thing about GFCIs is, they just keep you honest. It was already a violation and a safety hazard whether you have GFCIs or not. If you are comfortable working inside the panel, pull circuit 1‘s neutral,and shut off circuit 2‘s hot. Everything should be dead. If anything powers up, it is improperly using circuit 1's hot and circuit 2‘s neutral. Then reverse and test again. If you have any entangled neutrals, untangle them. Any hot wires that interact, their partner neutrals should be together, with nothing else. Not the answer you're looking for? Browse other questions tagged wiring switch gfci or ask your own question. 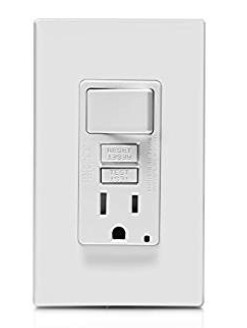 How to add GFCI to a box with one outlet controlled by a switch? 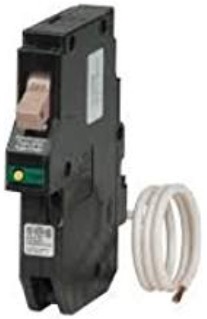 How do I install a GFCI receptacle to replace an old non-GFCI receptacle in a switch controlled outlet?